tonight Oct. 2nd at The Rialto Theatre in a KXCI Presents! concert, doors open at 7pm. 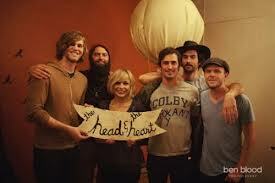 The Head And The Heart burst on the national music scene in 2011 with their Sub Pop debut, showcasing the Americana roots and strong vocal harmonies of their indie folk-pop. Blitzen Trapper are another Sub Pop band but have a darker edge to their indie folk rock. Bryan John Appleby is a Seatle based singer songwriter as well.